= Koukuubin de raburetaa ga todoita no. I will teach you some basic postal service related words. = Posuto ni toukan shite kudasai. = Please put a letter in the post-box. = Gojuu en kitte wo juumai kudasai. = Ten 80 yen stamps, please. = Hachijyuuen kitte wo hatte kudasai. = Please put a 80 yen stamp on. If you have a chance to stop by a Japanese post office, go check these 記念切手 ( = kinen kitte) . 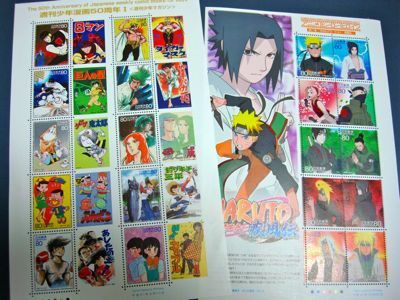 Sometimes you can find beautiful stamps and you can also buy animation character-stamps such as NARUTO, etc. = Sumimasen, kore koukuubin de okuruto ikura gurai kakarimasuka ? = Excuse me. How much would it cost to send this by airmail? = Sorenara funabin ni shite kudasai. = Then please send this by sea mail. = Funabin nara dono kurai(also pronounced “gurai”) jikan ga kakarimasu ka? = About how long does it take (to arrive) by sea mail? = I would like to mail this by express. = Kore kakitome ni shite kudasai. = Please send this by certificate. =Futsuu (yuubin ) de ii desuka? =Do you want to send this by regular mail? = Futsuu （yuubin） de iidesu. = Regular mail will be fine. 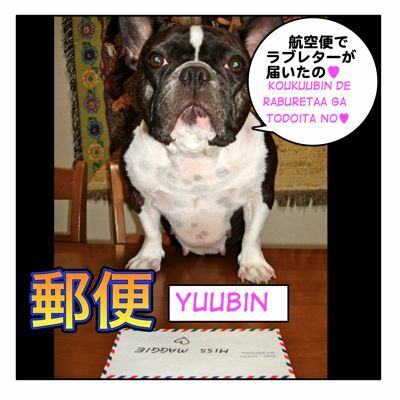 = Yuubin kozutsumi wo dashitai no desu ga.
=I would like to send a package by mail. = Yuupakku de onegai shimasu. = By postal package service, please. = Kochira no youshi ni gokinyuu kudasai. = Please fill out this form. = Naka ni otegami wa haitte imasuka? = Is there a letter inside? =Yuupakku to EMS to (dewa) dochiraga hayaku tsukimasu ka? = Which is faster, yuupakku or EMS　(*express service for International mail) ? = Haitatsubi no gokibou wa arimasu ka? = Do you have preference as to what day you want it delivered? = Naka ni nani ga haitte imasuka? = What’s inside it (the package)? Note : You can chose 配達日 ( = haitatsubi ) delivery date and 配達時間 ( = haitatsu jikan ) delivery time to send a postal package. = De minna no raburetaa wa itsu todoku no kashira? So, when can I get your love letters? If it is a big post office, they will accept a parcel until 7 pm. If it is a small post office, until 5 pm. This was a great post, thanks! (Sorry, I’m 7 years late) The 記念切手 got me really excited, but I’m wondering, do they still sell it, considering that most of them were released years ago? Every year, they sell different 記念切手. If you want old ones, you can buy them on some auction sites. They were selling Ghibli stamps last year. What about when you’re at the post office to receive mail or a parcel/package? In Australia there are PO Boxes or Post Office Boxes which you rent from the post office and they deliver your mail and your packages there. And then you collect everything from the box. If the packages are too large to fit in the box then a note or card is left advising that there is a package to collect and you take the note to the front counter to collect the package over the counter. Post office boxes are usually outside the post office so that they can be accessed 24/7. Most post offices also offer early collection before the post office opens where you can ring the doorbell near the PO Boxes. The postal worker will open the top half of the door and hand your package out this way. Is there anything like that in Japan? For example, when you get a 不在票 delivery notice, you can choose to pick the package/letter at the post office nearby instead of asking them to redeliver to your house. As for PO Boxes(私書箱=ししょばこ) , it is difficult to have your PO box at the post office unless you own a company or receive a lot of letters regularly. thank you very much for your great site. i am trying to find out the best way to express “please do not bend” on something i am going to mail to Japan but my many reference books don’t list this expression. could you let me know or include this in your post office page? ”please do not bend” in Japanese is 折り曲げないで下さい。(= Orimagenai de kudasai.) when you tell people not to fold. But we write 「折曲厳禁」(=orimage genkin), Do not fold, in red ink on the envelope like this.